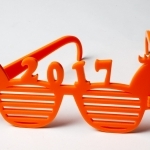 2017 is just around the corner, and you might have seen some funky “New Year” glasses that are quite popular this time of year. I’ve decided to make my own and share the design. These can be laser cut from 3mm Wood or Acrylic in various styles. 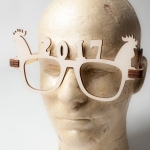 Since 2017 is Year of The Rooster according to Chinese calendar, I incorporated rooster head into he glasses frame. Apologies for last minute post, but I couldn’t get them just right until last minute. Acrylic shapes were especially challenging as there are thickness variations in both acrylic material and last cutter itself. Mine cuts slightly different in different spots, so this can cause some parts either being too loose or don’t fit at all. 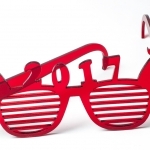 I’d like to give credit for fold-able mechanism for the glasses to author of this instrucable. Constructions is quite genius, and requires no screws or glue! Although I must admit I had to use some glue for acrylic parts, specifically “wavy” inserts that hold over the ear parts, otherwise they were falling out. I just didn’t have time to perfect it for glue-less fit. Instructable has detailed information in putting it together. 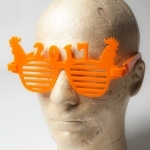 Another credit goes for instructables designer of “oketi” glasses. Here’s main link for the glasses design files. I included both AI and DXF files for your convenience. There are also both clear and “shutter” style glasses. I also plan to make an Illustrator tutorial how to modify design so you can design your own for 2018. How come do you have so clean edges on the ply glasses ?